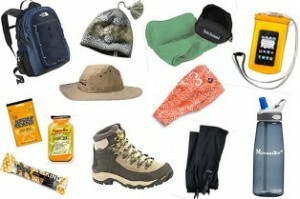 Most Kilimanjaro operators generally require that their clients supply their own personal gear for the climb. Operators typically provide the tents (personal tent and a mess tent for dining), cookware (stove, gas, plates, utensils, pans), furniture (chairs and tables for dining), first aid kits, and food and water. Kilimanjaro creates its own weather. And weather patterns can change very quickly. It is a necessity to have the gear that will keep you dry and warm, from top to bottom, for many hours at a time. If you have backpacked before, then you should already have most of the required items. If not, it is best that you ask experienced friends, or that you shop at a store such as REI so that you can get help from their associates, whom are quite knowledgeable. They can assist you in picking out the right clothing for your needs. The technology in modern fabrics allows for lightweight, warm, waterproof, and breathable functionality. Do not bring casual clothing such as cotton tees, or hoodies, or heavy jackets that aren’t that warm or waterproof. Gear lists should be provided by the operator. Insulated jacket – warm down jacket for the coldest days and nights. You wear this while hanging around at the campsite, or while sleeping in your tent, and during the summit night. Water proof jacket – Goretex or similar brand, breathable, waterproof jacket to stop wind and water from penetrating. Fleece jacket – a fleece is a less bulker version of the down jacket, and can be used while trekking and also as a double insulating layer during the summit night. Water proof pants – necessary in case you encounter rain, heavy wind or snow. You may wear these on summit night as well. Hiking pants – quick drying, lightweight pants, worn everyday. Fleece pants – warm pants you can put on at camp, and on summit night. See Do I Really Need All that Gear to Climb Kilimanjaro?